FLEXTECH is not just a foam fabricator. We are also an extension of your design and engineering team. Our success is based largely on our ability to collaborate with you on the design and development of innovative, engineered foam solutions for your new applications. 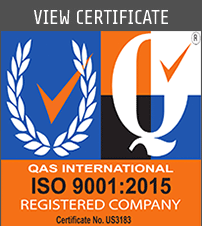 Our sales and product development team members have extensive experience working closely with our customers throughout the design and development process. Ideally, we are involved at the conceptual phase and can educate our customer on materials and their properties, our production capabilities and process limitations, etc. Our involvement at an early stage often helps minimize the time required to develop a new foam component. Our engineering team utilizes the most current version of Solidworks 3D CAD software. Solidworks is the ideal CAD software package for the design of both foam components and the tooling required to manufacture prototype and production parts. Another advantage to working with Flextech is our in-house tool shop. 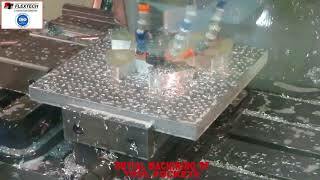 We not only design but also build the molds, cutting dies and fixtures we use to manufacture your parts. In doing so, we are able to build cost-effective, durable tools that will hold tight tolerances for the life of a project. Having our tool shop in our own facility allows us to expedite any necessary modifications during the prototype stage. It also allows us to make any required repairs to production tools with very little downtime. 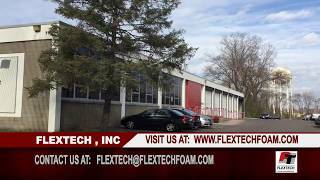 FLEXTECH has built a very loyal customer base by delivering innovative foam solutions and consistently providing an exceptional level of customer service. 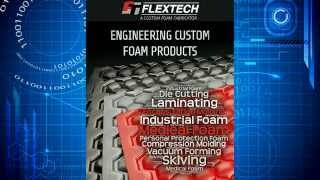 From your initial contact with a Flextech sales person, through the development process with our engineers and on to our customer service associates, we endeavor to be the most responsive, customer oriented foam fabricator in the industry. Flextech supplies custom foam components to a diverse customer base in several markets. The primary markets we serve are Medical, Industrial and Personal Protection. We manufacture a wide array of components from simple to highly engineered products for each market. 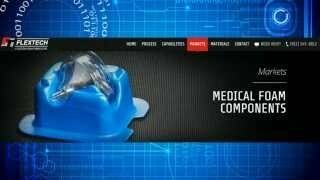 Within the Medical market we provide die cut surgical consumables to engineered, encapsulation molded electronic circuitry. In the Industrial market we provide fabricated gaskets and filtration media to complex, molded thermal insulation assemblies. 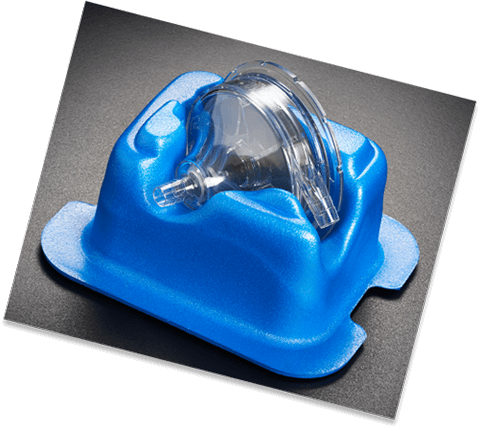 In the Personal Protection market we provide components that range from molded foam seals for ski and industrial goggles to dual density molded liners for military helmets. Please browse the Markets pages of our site for information on applications and images of parts we manufacture. Our company has been working with Flextech, Inc. for the past five years and have found them to be one of our very best vendors. Their professionalism in handling contracts and negotiations is based on giving the customer the best possible price for the best possible timeframe. Their responsiveness has been excellent. They have moved up shipments when we need the products sooner and they have even overnighted small quantities to help us meet our customer’s needs. They even are proactive and contact us at least a month prior to ship dates, just to see if we need anything sooner or to increase the shipment. Their sales and customer service personnel have always been quick to find information and always have provided accurate and timely answers to our questions. To repeat, they are one of our very best vendors.